This Beautiful Grace: From the Shelf: Thanksgiving Stuff! From the Shelf: Thanksgiving Stuff! The season of Thanks is here! I'm looking forward to some time with my little family & some hot chocolate with cream......focused on God's bounty in our lives with purposeful thanks-giving. I admit it...I'm a resource junkie. Now I realize that having lots of resources is certainly not necessary in order to practice the habit of gratitude and to fully celebrate Thanksgiving. But they help me to have a plan for helping to focus our minds, hearts and hands in creative ways. They save me brain waves. And most of all.....resources get me excited. I can't help it. It's my kid heart, I guess. And excitement is contageous. So books & resources are a shameless priority in our budget over lots of other things. 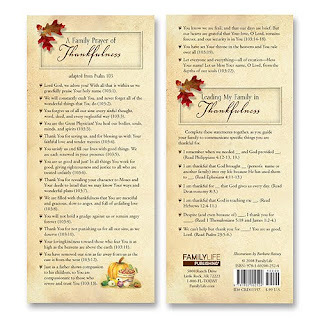 I think http://www.familylife.com/ resources are the absolute best we've found for making Thanksgiving meaningful. The first three are new this year and I can't wait to get them in the mail!! You can listen here to programs about some of these resources. It is easy to rush through the holiday on the way to Christmas and get to the other side wondering if you ever really settled into the meaning. These resources can help get everyone tuned-in weeks in advance . 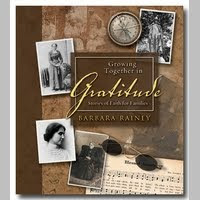 Growing Together in Gratitude - a family devotional including stories of people who have been grateful even in difficult circumstances. New! 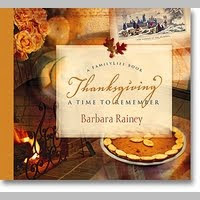 Thanksgiving: A Time to Remember - Barbara Rainey's classic Thanksgiving resources....available in Audio version, coffee table book & CD of Thanksgiving hymns. ThanksLiving Treasures - This is an awesome Thanksgiving kit from Family Life, but they don't make it anymore. We got it in the used homeschooling section of our Christian Book Store. There happens to be one for sale NOW on Amazon.com! (Click the orange link.) I think this may be the first time I've ever found another one for sale - and it says it's new! Ours includes: a 6-day devotional with stories, scriptures, discussion, application, and activities. 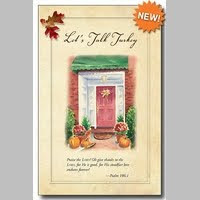 Plus a special section with ideas for Thanksgiving Day celebration. There are printed art cards illustrating points in the Thanksgiving story, as well as visual pieces to use with the lessons (a replica of the Mayflower, corn, cross, small Bible). Also: recipes, resources, websites.....It's $20.00, but it's cool! We also have a thick red journal that we pass around at Thanksgiving each year and let everyone write their thoughts of gratitude looking back over the year. It is a treasure. I just had a thought that I am going to TRY to make sure I implement this year!! An ongoing scrapbook album themed for Thanksgiving...cards for everyone's thoughts along with a few random photos.